Garden Cottage has a double aspect sitting room and dining room with double doors leading out onto the terrace and garden. Flat screen digital smart TV and wireless broadband. Compact fully equipped kitchen overlooking the garden, with washing machine, dishwasher, fridge freezer, microwave and multi fuel cooker. Gas central heating and constant hot water. Open staircase leads to two bedrooms, the larger bedroom has a standard double divan and the smaller bedroom two single divans. Beautiful private garden with roses and honeysuckle, as well as many containers with bamboo, magnolia and flowering shrubs. Patio with table and chairs. 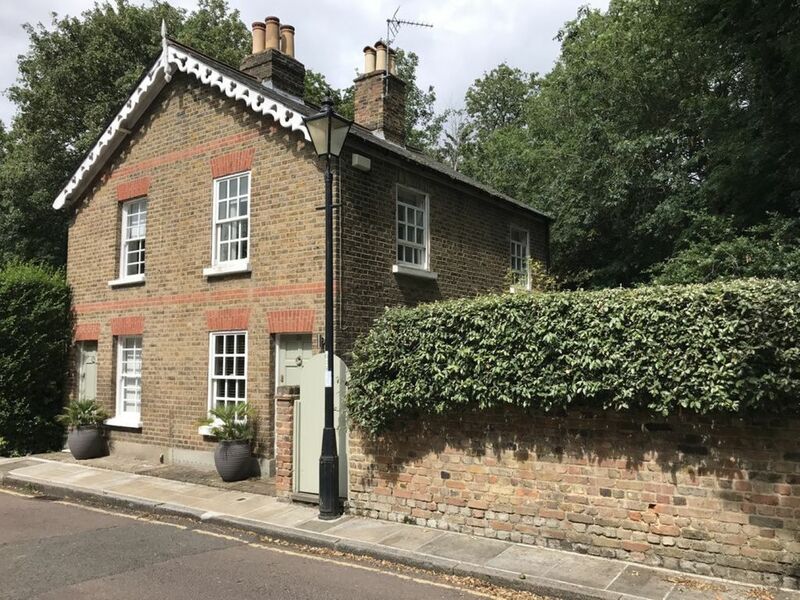 One of a pair of Victorian cottages, which back onto beautiful Marble Hill House and park on the River Thames between Richmond and Twickenham Riverside. The cottage is located in one of the most prestigious streets in the area, surrounded by stunning early eighteenth century architecture, with two houses boasting blue plaques. There is no through traffic making the street very quiet. Residents parking permit available, please ask before booking. Already booked a return trip! All the positive things that others have said are true, so I won't repeat them. Suffice it to say that I couldn't leave without booking a return visit. We stayed at the start of June 2015 with our two girls (3 and 5). This is such a lovely cottage - really peaceful and lovely having some outside space. It is also so close to everything you need. We had picnics in the park which is literally just round the corner, yet were only 10 mins walk from the station to get into London if that is what you fancy. St Margarets is lovely and has enough coffee shops and restaurants to keep anyone going! The cottage itself was perfect for what we wanted - it isn't huge but the four of us had plenty of space, even with all of the stuff the young children bring with them! The small touches like handwash, washing up liquid, kitchen towel etc make life much easier. We hope to come again. We stayed in the Garden Cottage - a party of 4 adults and 1 small dog - who loved the small, patio garden. The cottage is comfortable and well supplied with the basic necessities that you need on arrival. It is located in a peaceful cul-de-sac and conveniently situated for public transportation links to Hampton Court Palace and the City of London. Val, the owner was extremely helpful at all times and provided us with excellent information on how best to travel into London. Following her advice we walked (about 8 mins) from the cottage to St. Margaret's station, caught the above ground train to Waterloo, then a quick and easy change to the Bakerloo line into Piccadilly.Total travel time from cottage - 45-50 mins. Upon departure from the cottage, Val followed up with us regarding our stay and promptly returned our security deposit. This is the mark of a very good hostess! And thank you to Freddie for checking us in on the Sunday. This is a lovely, quiet, restful place to stay. The property was well maintained, clean, with literature on how the appliances, wifi, etc. worked. The location is 10 min from the train station and closer to regular bus service; and a short walk to the Thames; 30 minute by train to London Waterloo. We found two great pubs and enjoyed our time so much we want to go back! We thoroughly enjoyed our week's stay in this lovely cottage. It is in a delightful location in a quiet cul-de-sac with the river walk and parks close by. There is a local bus stop at the top of the road and St Margarets train station is within easy walking distance. The description of the cottage was quite accurate. It was very comfortable & provided me with a good base & also allowed me plenty of opportunity to entertain my two children & grandchildren who have moved to England from Australia. I also brought my daughter & another grandchild & all amenities required for a baby were provided including a stair barrier. The location to transport was excellent & the streetscape delightful. We hired a car which wasn't necessary as buses to the airport & Hampton Court were nearby as was St Margaret's station. Restaurants were plentiful nearby so it all made for an easy stay. The owner is a great communicator & was in touch via text to ensure we were happy. Excellent.